2 Pairs included. 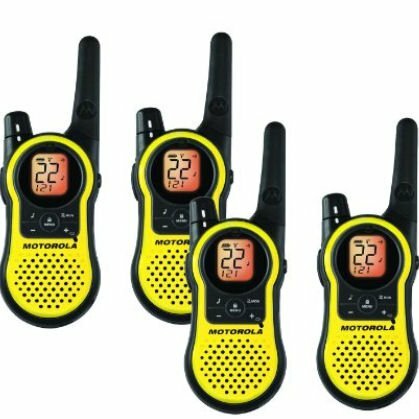 Keep in touch with your fellow adventurers during camping, hunting or skiing with the Motorola Talkabout 2-way radio. It has 22 channels with 10 privacy codes. Its IP-67 standard keeps you connected even after getting dunked in water or in heavy rains. It has a water-resistant design that floats on water and is brightly colored for easy identification. This MS350 radio has non-slip surface for comfortable hold. Its 8 VOX sensitivity levels minimize the background noise. This rechargeable radio has built-in repeater channels and works with the local stations to convey your message up to 35 miles away. Its 7 NOAA channels provide warnings about dangerous weather conditions and precautionary measures. This GMRS/FRS radio has VOX Voice-Activated Control and vibrating alert. It can store about 100 contacts. Comes with 2 radios, belt clips, checklist, dual drop-in charger, rechargeable battery packs, charging adapter and user's guide.